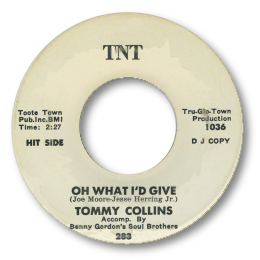 New Yorker Tommy Collins apparently started off singing by joining doo wop group the Paragons, cutting one 45 for Winley in 1959. But his masterpiece is the excellent deep ballad Oh What I’d Give. This has all the necessary ingredients for its classic status – a finely judged vocal from Tommy, an arpeggio styled piano and guitar, and a well arranged horn section. I love the chord changes on the hookline – but most of all I appreciate Tommy’s great hoarse vocal. I’m sure you will too. Beware the Tommy Collins on Capitol and Tower – this is a country artist.